Redshirt freshman Jake Haener entered the game under center for the Huskies at the 1:56 mark of third quarter, replacing a struggling Jake Browning who did not have an injury designation at the time of his benching. A few plays later, Evan Weaver read Haener’s eyes over the middle of the field, snatching his first career interception — and subsequently, his first career pick-six after stretching for the goal-line on a 37-yard return. The interception was Washington’s second of the game, while on the flip side, the typically turnover-plagued Bears did not give it away once on Saturday. Head coach Justin Wilcox has stressed the importance of avoiding self-inflicted mistakes, and the Bears’ ineffective offense did have that bright spot to its name. When Browning did return, it came with 11:37 remaining in the game, and the Huskies trailing by just five points with favorable field position. But Cal’s defense was ready again, bending at times, but hardly breaking. Weaver, Alex Funches, Camryn Bynum and company struggled to open the game, unable to get off the field on a pair of third-and-longs and a key fourth down when Browning was able to escape the pocket. 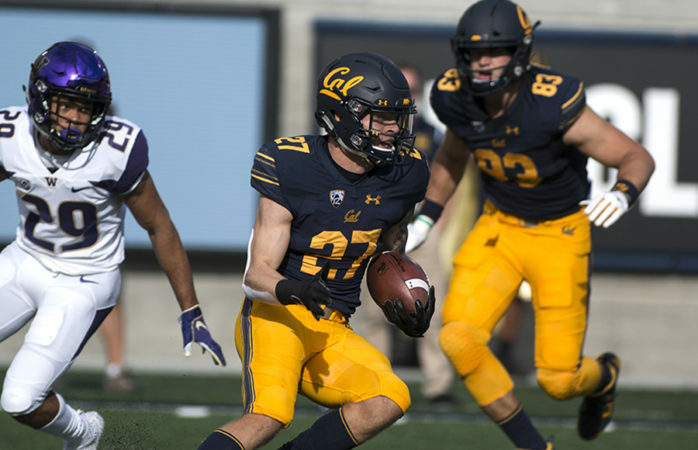 But time and time again, the defense forced the Myles Gaskin-less Huskies from moving forward, flipping the field position in favor of Cal’s equally struggling offense. Gaskin’s absence, which wasn’t evident until Washington’s running back committee became the game plan early and often. But neither Kamari Pleasant, Sean McGrew nor Salvon Ahmed could make a significant dent in Cal’s stone-cold front, as Husky rushers combined for just 91 yards on the ground. Arguably Cal’s best defensive plays came on a pair of interceptions from Bynum and Weaver, both of which were equally impressive in their own right. But the stat that deserves the most noise is the sheer number of tackles-for-loss combined between the two teams. Washington’s defense, anchored by Ben Burr-Kirven and Greg Gaines, gave Chase Garbers and Patrick Laird all they can handle basically throughout the whole game, as the Huskies recorded nine tackles for loss to their name. On the flip side, the Bears picked up an eye-opening eight such plays, good for 39 yards. Also for the first time in 2018? A game with zero turnovers from the Cal offense. The Bears will make the long trip to Pullman for an uphill grind against Gardner Minshew and the upstart Cougars next weekend, who are fresh off a huge win on the road against No. 24 Stanford. The path to six wins got a whole lot easier with the biggest win of 2018, as Wilcox got the best of his former mentor Petersen in a defensive showdown for the ages. Minshew and the Washington State offense has been electric in nearly all facets, but with the way Cal’s defense performed on Saturday evening, the 11-headed monster deserves the respect its worked hard to earn. Josh Yuen is the sports editor. Contact him at jyuen@dailycal.org. Follow him on Twitter @joshcal2020.